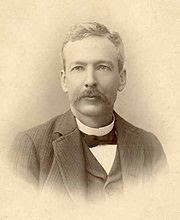 Luther Burbank was born on March 7, 1849 in Lancaster Massachusetts, the thirteenth of fifteen children born to Samuel Walton Burbank by three marriages. A slight child, he was very introverted, making friends with plants and carrying around a cactus plant like a doll. In school he was a good student and a good writer. While still a boy he began work in the shops of the Ames Plow Company, in which his uncle Luther Ross was in a position of authority. Luther worked half days in the shop and spent his afternoons among his uncle's seedling grapes and rhubarbs. Working in the factory he developed a labor saving device, for which he received a raise. His ill health forced him to leave the factory to work outdoors in the fields. Making his living by raising crops he developed a potato, known as the Burbank potato, which was the first of hundreds of varieties of new plants which he developed. While working in the garden on day Luther developed a partial sunstroke, and it was due to his health he was forced to migrate west, moving to Santa Rosa, California in 1875, carrying with him ten of his potatoes. In Santa Rosa he was forced to seek work wherever he could find it, once taking work at a chicken ranch where he cleaned out chicken houses, and even sleeping in one. Hard work, exposure, and frequent lack of food brought on a fever which nearly killed him. Salvation came in the form of a kind lady who provided him with a pint of sweet milk a day. When he recovered from his illness he secured a position at a small nursery. Burbank wanted to work on his own and he soon acquired a plot of land of his own on which he started his own nursery. Finally working for himself Burbank was able to fill the order of a man who wanted prune trees (which normally take two years to grow) in a shorter time the buyer demanded by inserting prune buds into almond plants. At his first opportunity he left the nursery business to become a plant breeder. From his small home in Santa Rosa, Burbank has created over eight hundred new varieties of plants (a partial list can be found here). Burbank's work earned him the nickname "the Wizard of Santa Rosa"
Burbank was not able to patent the plants he developed because the patent laws did not allow the patenting of plants until after his death. He was however granted sixteen patents after his death, after a law was passed allowing them. In 1986 he was inducted into the inventor's hall of fame. Burbank died on April 11, 1926.